But no, Canadians typically don't approve of torturing prisoners. I don't think any country that's been to war is completely guilt-free. tortured and killed by Canadian Peacekeepers. google-minutes. What more would I have found in Ten minutes instead of Three? not just a few rogue soldiers, it's government policy. have been official US government policy to torture the prisoners. ... and your point is what exactly? intallegence from POWs. Won't change! 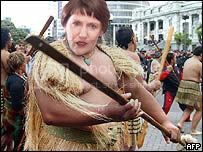 Le Tue, 1 Jun 2004 09:22:22 +0100, "nick"
Prime Minister Helen Clark fights for Maori rights. Pizza Express Man and his pizza eating cat Gayrab. passports get stolen it wouldn't be a problem. suit the West so much better. less accord its wearer any special kindnesses.